Hazardous Chemicals in the Workplace? The Hazardous Chemicals in the Workplace? 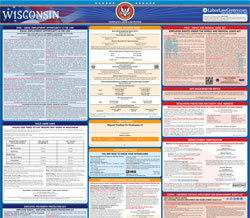 is a job safety law poster by the Wisconsin Department Of Workforce Development. This poster is mandatory for some employers, including public sector employers. This poster must be posted in a conspicuous place by all public sector employers so employees can see it. This poster describes the rights employees have with regard to dealing with hazardous chemicals in the workplace and what employers must provide employees with to be able to appropriately deal with hazardous chemicals in the workplace. It appears you don't have a PDF plugin for this browser. Please see the link below to download wisconsin-sbd6894.pdf. pesticides	, an	d infectiou	s agent	s in th	e workplace. 	 Acces	s to Materia	l Safet	y Dat	a Sheet	s an	d containe	r labels. 	 Forma	l trainin	g in prope	r procedure	s fo	r managin	g hazardou	s chemicals. 	 A	 written	 chemical	 hazard	 communication	 program.